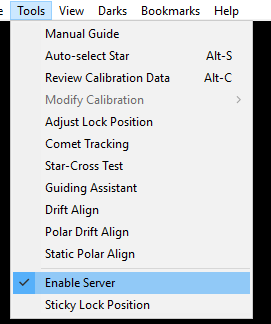 The user guide for SGP says that in order for dithering option to work “PHD Server” must be enabled through Tools menu. I don’t see that option in PHD2. Could it be this part of the SGP manual requires updating? The PHD server can be Enabled/Disabled under the “Tools” menu. The server allows SGP to send and receive messages from PHD. You should turn on dithering in SPG and not in PHD. In PHD you need to have Enable Server checked as shown in your screen shot. You also need to select your dither pattern. I like “spiral”. Actually, PHD can do the dithering. 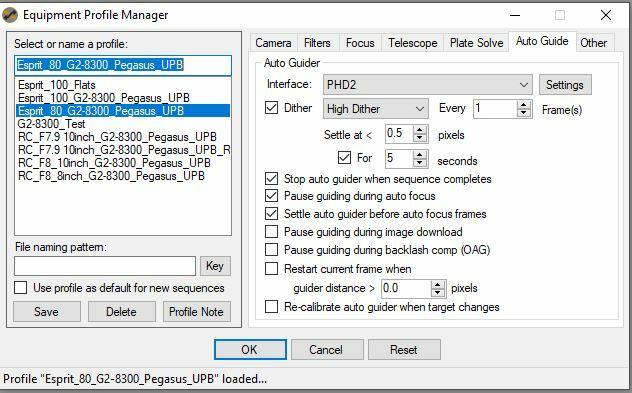 Your imaging software can send a “dither message” to PHD and let PHD doing the dithering. The imaging software that comes with Atik cameras can dither this way. In SGP, the dithering is turned off in PHD and SGP does the dithering. Yes, what threw me was the phrase “PHD Server” put in quotation marks so tightly that I thought I would be seeing the exact phrase. Then I saw the “Enable Server” instead. I haven’t seen dithering options in PHD2, but I will look for it. 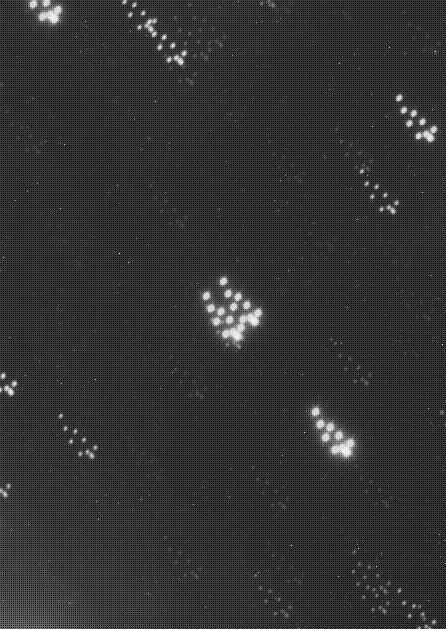 If they both are able to dither I would prefer to leave it to the imaging software than to PHD2 whose job is guiding. Here is a a stack of dithered images that have not be registered. You’ll see some hot pixels. When the stars are registered the hot pixels disappear. I know you know this, but I thought I’d share. If they both are able to dither I would prefer to leave it to the imaging software than to PHD2 whose job is guiding. 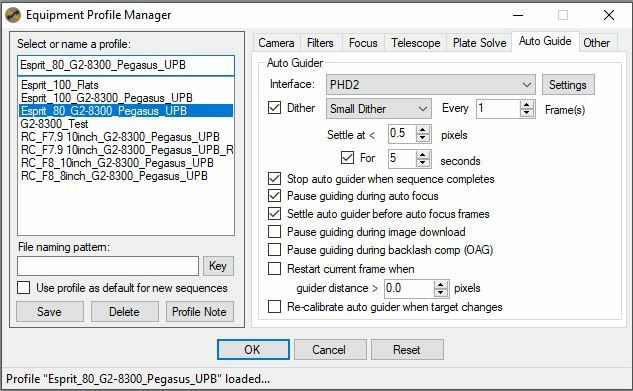 Dithering involves both the imaging app (SGP) and the guiding app (PHD2). Only SGP knows when to dither (between subs), and when the time is right SGP commands PHD2 to dither. PHD2 responds by moving its lock position, guiding the guide star to the new lock position, then reporting back to SGP that the dither is done and that guiding has settled. So in reality there isn’t a choice in which software we depend on to initiate dither - SGP initiates it and PHD2 does it. Is there any productive way (through settings) to speed up the process of dithering and recovering from dithering. When a sequence has been created - the estimated time of the sequence is featured. But I need to multiple that by 1.32 which get’s close to the real time as I have to factor in the “TIME” for dithering. I elect “extreme dithering” but doubt this has any bearing. Sorry to drag this issue up, can I clarify? I have PHD2 set up to dither random with a scale of 1, then I have SGP setup up to dither High under guiding with all my parameters setup. IN SGP I save the settings, double check and quadruple check this, then when i start a sequence It goes back to small dither. Am I right in presuming that PHD2 take preference over SGP? If so does SGP still waiting for the guider to settle after dithering? 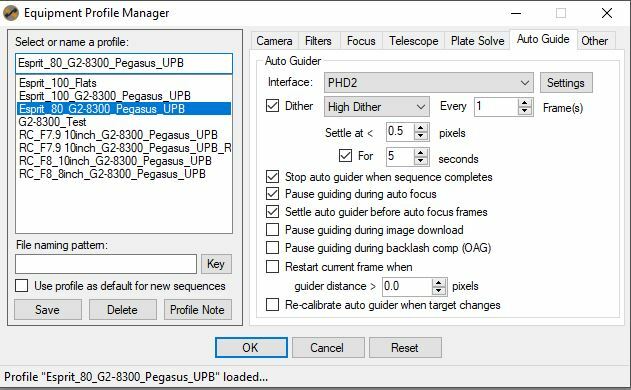 Which is better, to allow PHD2 to dither or let SGP do so? I really want to do a high dither, so not sure how to increase the dither in PHD2. You should let PHD2 be launched and managed (for dithering) by SGP. You’ll want SGP to initiate the dither (I’m honestly not sure how you would even setup PHD2 to initiate the dither?). I’m not sure why SGP is going back to small dither. Are you setting this in the Control Panel or in the Equipment Profile? Changes in the Equipment Profile will not be reflected on all your Sequences unless you update them. I am conversant with the difference between the Control Panel and the Equipment profile and how to save things correctly thank-you and don’t need to refer to the link when there is obviously a function problem. I can replicate this every time and have tried it with a mates setup and the problem still remains. So which is SGP working to, a small dither or high dither, it would appear that the dither profile is not refreshing when relaunched? Hi Farzad, the issue is with the refresh of the dither settings, see the images, I want SGP to manage the dither, but need to make sure that is is doing it at the correct setting. It looks like it makes its way down to the sequence correctly. I’ll address the issue with the profile. Thanks, I have just noticed that you fixed this, much appreciated.